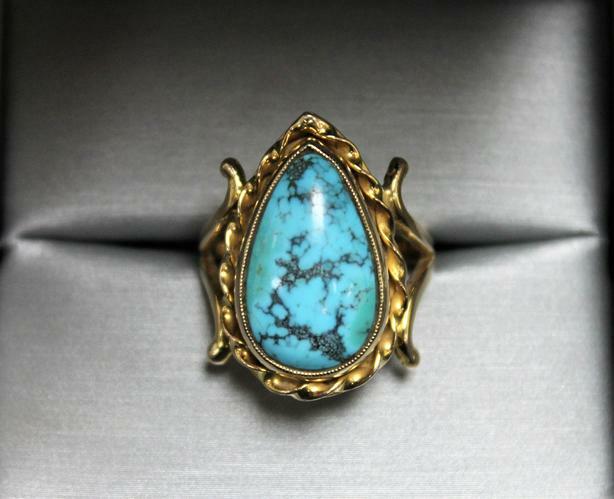 Features : Pear Cut Turquoise Ring set in 10K Yellow Gold. Truly one of a kind! We also have more items for sale at The Bay Street Broker. Located on the corner of Bay and Government Street with FREE Customer Parking! 9:00 am - 6:00 pm Monday - Saturdays. 10:00 am - 6:00 pm Sundays. (250) 383-SHOP(7467) WE BUY, SELL, TRADE & CONSIGN.